George H.W. Bush Receives Final Funeral In Houston Bush's grandson George P. Bush remembered his grandfather as gracious, decent and humble, in the final public memorial ceremony for the 41st president. George P. Bush gives a eulogy during the funeral service for his grandfather, former President George H.W. Bush, at St. Martins Episcopal Church in Houston on Thursday. Former president George H.W. 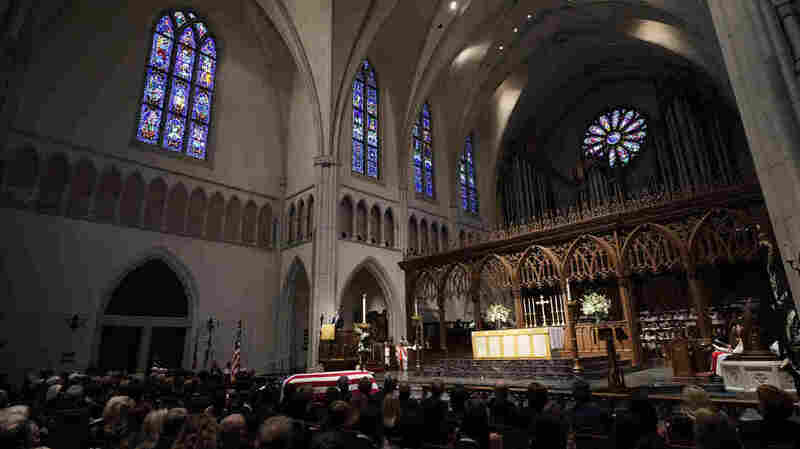 Bush was remembered by his grandson as gracious, decent and humble, as he received his final public memorial ceremony at St. Martin's Episcopal Church in Houston on Thursday. The funeral came after several days of remembrance in the nation's capital. Bush died last week at the age of 94. He will be buried in a private ceremony on Thursday afternoon. On Wednesday, the former president received a state funeral at Washington National Cathedral in the nation's capital, with all five living presidents in attendance. "Denton Ragland said he worked on Bush's presidential campaign in 1988, and that he's gotten more emotional about Bush's death than he expected.
" 'He's an enduring example of what we should all strive for in our personal lives and the life of our country,' he said, choking up. "Jan Robertson, a U.S. history teacher at George Bush High School, was wearing an American flag shirt and Santa Claus socks in honor of Bush. "She said the late president's kindness is what the country needs to get back to." The funeral service began at 10 a.m. local time on Thursday, with more than a thousand people in attendance, according to The Associated Press. St. Martin's Episcopal Church was the Bush family church, and Bush's longtime pastor delivered the homily. Several of Bush's grandchildren gave readings at the funeral, and grandson George P. Bush, the land commissioner of Texas, delivered a eulogy praising his grandfather's service to others and his commitment to his family. Bush's former secretary of state James Baker also gave a eulogy. Yao Ming, who formerly played for the Houston Rockets, and Houston Texans defensive end J.J. Watt were among those attending the funeral. "Bush was always very supportive of Houston's sports teams," Houston Public Media notes. Bush's casket was then scheduled to be carried by train — a special "Locomotive 4141" — to his presidential library at Texas A&M University, to be laid to rest in a family plot.